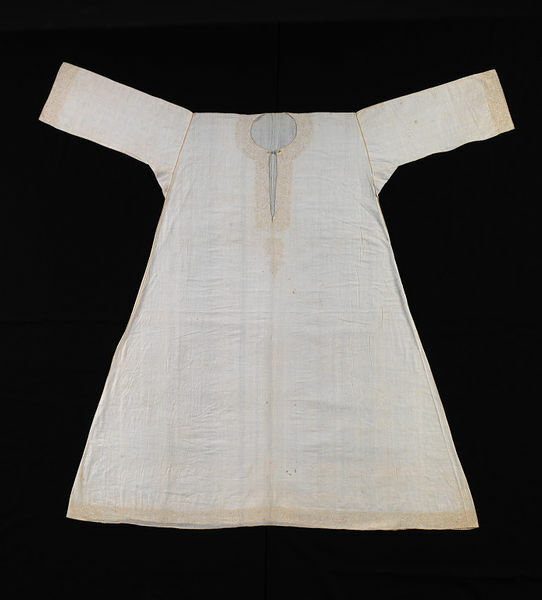 This is a rare example of a 27th-century linen garment. The motifs of its decoration are not the roses, carnations, borage, etc, so typical of contemporary English textiles, but lotus and palmate motifs characteristic of Italian and Ottoman silks. The embroidery is entirely in chain stitch in unbleached silk thread, and the seams are backstitched with silk thread. The seams are worked with button-hole insertion stitch in silk and there is a button-hole picot edging around the hem, neck and wrists. From the early 16th century until the 1630s, Portugal had trading posts in Bengal and imported textiles including embroideries in yellow silk on cotton. By the mid-16th century, Lisbon was producing needlework using linen instead of cotton. Initially, the designs copied Indian embroideries, but soon began incorporating other influences from Islamic and European art. There are a several embroidered linen quilts in the Indo-Portuguese style in museum collections. Garments are rarer; the V&A has a cloak, T.105-1913, and part of a cloak, 1016-1877. The Museu Nacionale de Lisboa, has a linen alb (15988 MNT) of slightly different shape, but embroidered in a comparable manner. The garment is T-shaped, with diagonal side gores, a round neck and and no cuffs at the wrists. It may have been made in Lisbon as a camisa mourisca (Moorish-style smock) and worn in England as a woman’s night smock. This smock is a T-shaped garment wider at the hem than the shoulders, with long, open sleeves, a round neck with single button fastening. 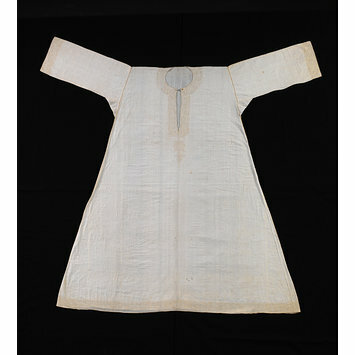 The smock is embroidered at the hem, sleeve, ends and neck in palmate and lotus motifs, with embroidered insertion seams and an embroidered picot edging. F, Portuguese, c1630-1660, pale yellow silk embroidery in chainstitch on linen.